If you haven’t downloaded the 18 Birdies app, why are you waiting? It seems like there are a million golf apps available, well today I’m going to explain why I feel 18 Birdies is by far the best. As a self-proclaimed golf geek, one area of my obsession I’ve been, well, obsessed with is the implementation of Smart Phones and golf. For years I’ve been trying to find “The Perfect” app that does it all. And, for years I’ve been disappointed with what has been available. 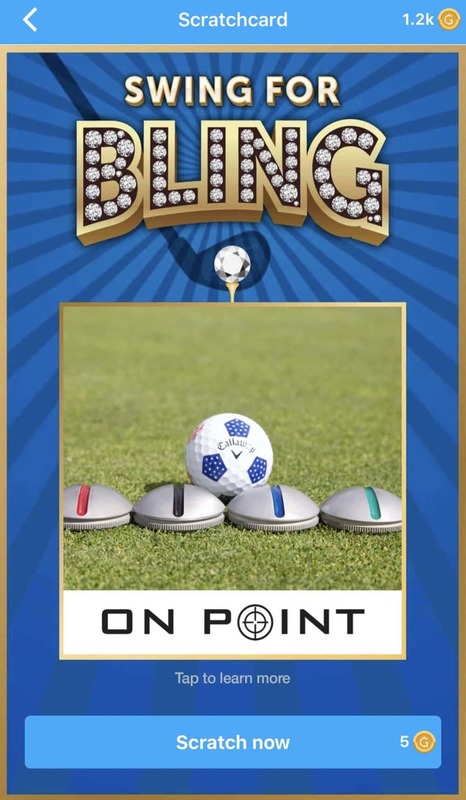 At one point I even considered reaching out to a developer and giving them my input to see if we could create an app that met all the needs of the modern golfer. That never happened, call it what you will, laziness, lack of knowing who to talk to or just an incredibly busy life, my desire to create an app didn’t outweigh my passion for wanting to play more golf. That was until I started messing around with the 18 Birdies app. 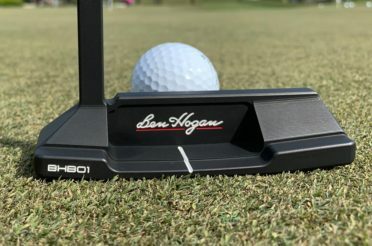 Over the last year it’s been my go-to app on my phone for golf, and after if you’re not aware of what it is or what it is all about, I look forward to hearing your comments after you finish the article. Because in my opinion, 18 Birdies is the best golf app there is, period. 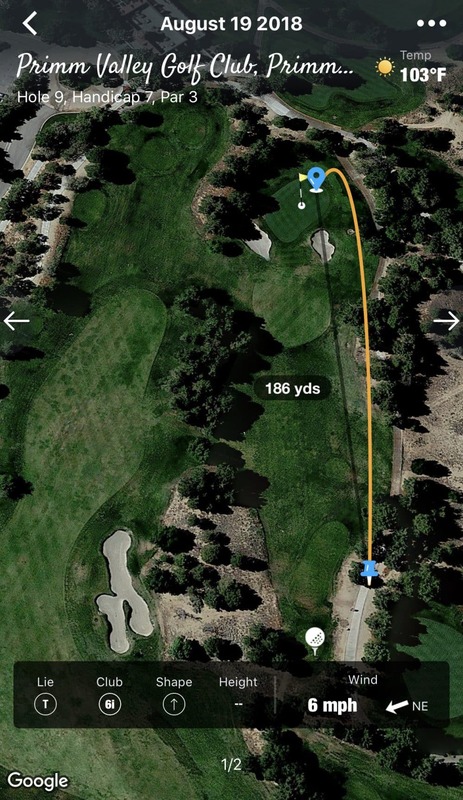 What makes a great golf app? For one, it has to be user-friendly. Up until my download of 18 Birdies the golf app I enjoyed the most was one by Loudmouth Golf. Now that app wasn’t theirs; they had bought a version and put their little twist on it. But what made it so enjoyable in my opinion was how easy it was to use. At the time my daughter was starting to play golf a little, and she LOVED inputting the info from the hole we had just played. 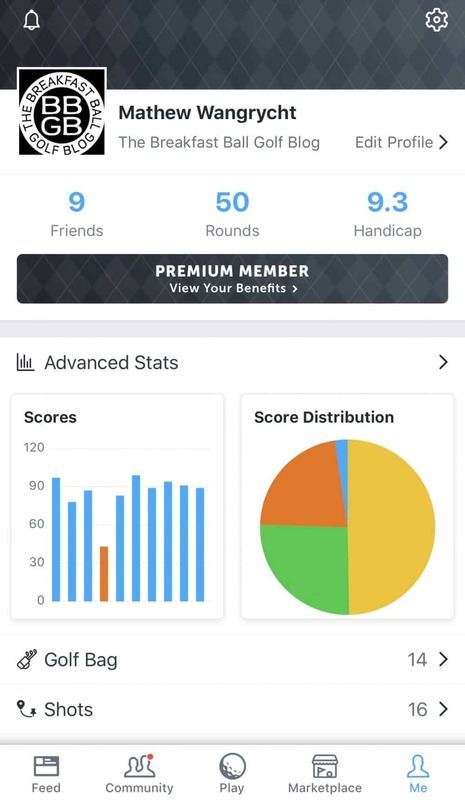 Where the Loudmouth app fell short was how it was limited to just inputting a score and a horrible interface with Facebook in an attempt to share your scorecard. 18 Birdies came in with a game plan that has accomplished all these needs and then some. Let’s face facts. If you can’t work the app and it can cause more of a distraction than assistance, and then you’re in trouble. Technology isn’t for everyone and even if it, it’s not for everyone on the golf course. More than once I’ve been reminded by my playing partners that “You know we’re playing golf bro.” subtle but sincere hints like that are a sure bet you’re messing with the wrong app. 18 Birdies have nailed the user-friendly aspect of the golf app. It loads quickly; the location service brings the course you’re about to play to the main screen, so there is no searching for the right course and scorecard. You have everything you need right on the screen. There is no scrolling required, the course layout, via GPS, is perfect and from my experience, so far, is the best I’ve used in an app. As a Golf Geek, I need my stats. Now 18 Birdies is a free app, but there is a premium feature I’ll dive into a little later. For this section, please note that I am a premium member, and some of the additional stats mentioned come with that level of membership. Just a few. The stats for Putts per Hole, Greens in Regulation, Fairways Hit, Sand Saves, Up & Downs and Penalties is self-explanatory, so I’m going to pass up going into detail about them. But, here’s some info on the other stat tracking options. This view shows all of your rounds played that you have inputted into 18 Birdies. There is a “Filters” tab you can select to break down the rounds to a favorable view like the number of rounds/duration, round type, play type, and slope rating. I only have one gripe about the filters section. I wish they had an annual option, I like to track my stats from year to year, and I want to be able to see my season stats from Jan-Dec. Here you can see how your scoring is broken-down to what you made on the holes during the round. Birdie or better, Par, Bogey, Double or worse. The app displays the info in a pie chart, so it’s effortless to read. The filter option is also available on this screen as well. For this stat, the app takes a look at how you perform on each of the Par holes you played. Par 3, Par 4 and Par 5’s. It shows you how you’ve performed on each of the hole types in a Bar Chart. This filter option is also available for this stat. That makes it nice to see how you’ve done on Par 3 holes over the last 20 rounds. 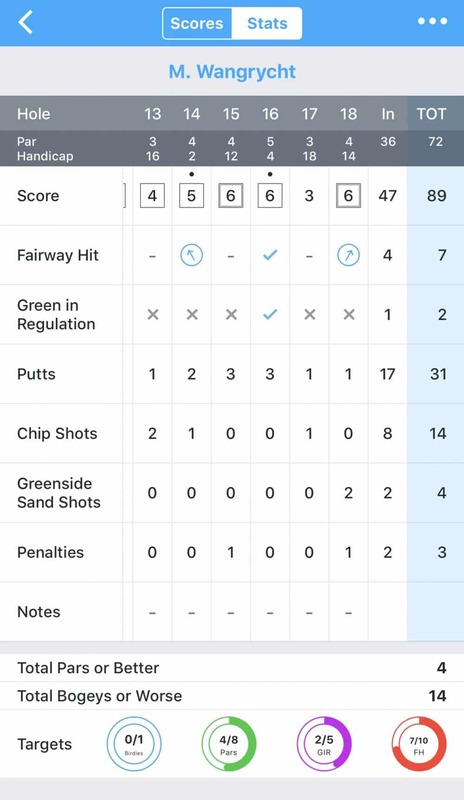 One of my favorite stats by far on the 18 Birdies app. At the begging of the round, you can choose your “targets” for the round. It’s projecting how you think you’ll do or how you think you should play for the upcoming round. You can select how many birdies you think you’ll have as well as Pars, Greens Hit and Fairways Hit. There are a ton of side games you can play with other users of the 18 Birdies app. If you’re one of those players that like to have something riding on the match. Here you can view how you’ve done in the games you’ve played against other users. 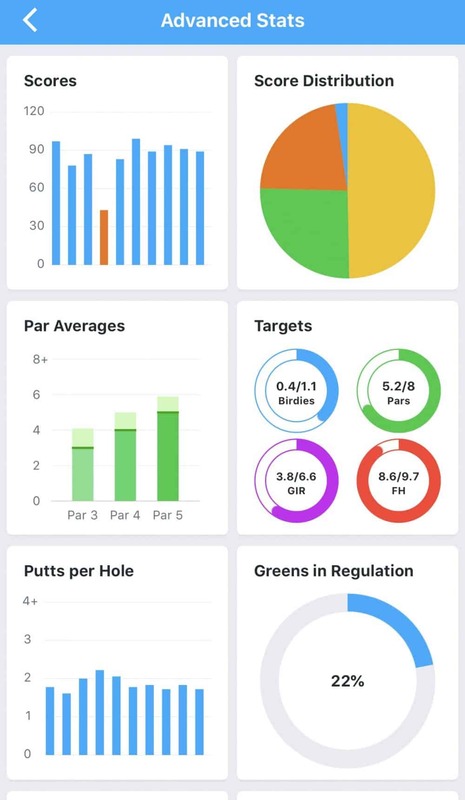 Aside from the filters option I like to see the only other feature I want to see them add to the stats on the scorecard page is scrambling percentage. Other than that the App is perfection. It’s become a fixture in the golfing world. Today’s golfers love to share their experiences on the course. 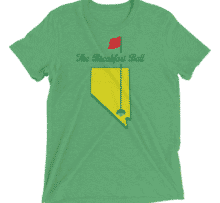 Be it an excellent shot, a HOT cart girl, a putt that went in that never should have or a career-best on your favorite course. Now more than ever there are so many ways for us to share our experiences golfing with others. I’ll be honest; I haven’t taken full advantage of the social side of things when it comes to 18 Birdies. I’ve mainly used it to share rounds with my close friends who don’t live in Vegas. That in no way is a negative in regards to the app. I’m not sure any golf app will be able to challenge the power players in the social sharing game. Instagram, Twitter, Facebook, and even YouTube are icons when it comes to sharing. But, 18 Birdies is doing what they need to do to have it be a part of their interface. Regardless if I use it or not the option for you to create a network of friends or even reach out to golfers in an area where you’re going to be visiting, is a nice feature to have. With so many options for a good golf app, there have to be some features that put the app over the top to be considered elite. 18 Birdies implemented GPS and brought and changed the way people interact with a device on the course. A few updates ago 18 Birdies made a massive improvement when they combined the scoring screen with the GPS. Everything is right there on the main screen of your phone. Even if you don’t utilize the app for GPS, the fact that it’s right there every time you open the app is excellent. There are times when you’re not sure how the hole may layout. Either first time playing the course or a situation where you’re not sure what’s in front of the green, or your vision is blocked by an obstruction. With a quick look, you open the app and boom, your right there looking at the hole and easing your mind about the next shot. 18 Birdies app, it’s saving me strokes! Most of the courses I play here in town I’m familiar with, so the GPS feature isn’t used very much. But just yesterday I was in a spot I hadn’t been before, and I wasn’t sure what a needed to do to get to the green. It was one of those silly tee shots that don’t go your way. 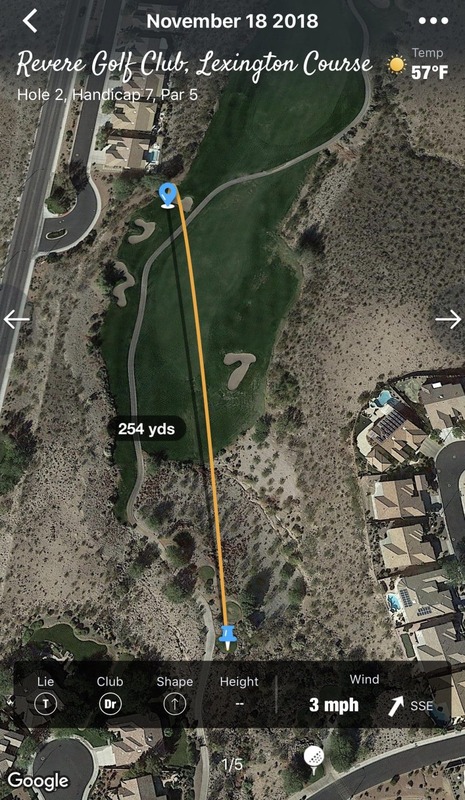 I considered laying up to the just beyond the 150, but after looking at the app, I saw there was a ton of room after the desert area that was blocking my view of the green. Seeing where I could play to had me pull out my 5Wood. The shot came up just short, but I was able to get up and down with a simple chip and a putt. 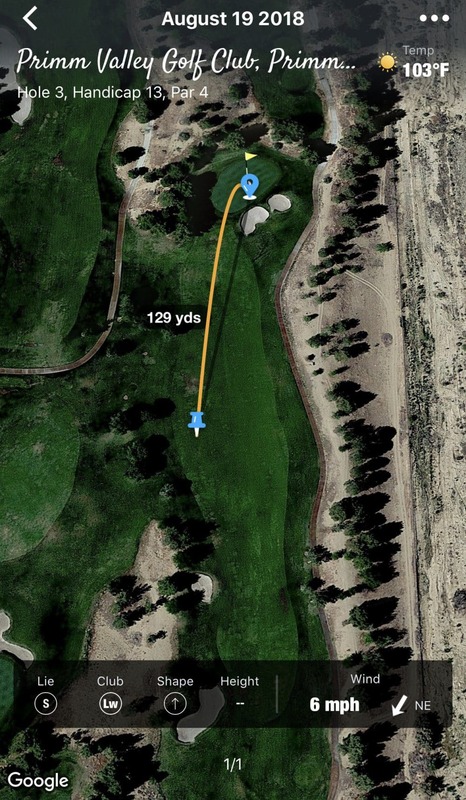 The 18 Birdies app literally saved me from hitting my 3rd shot from 140 vs. the easy chip greenside. That’s a big deal in my opinion. 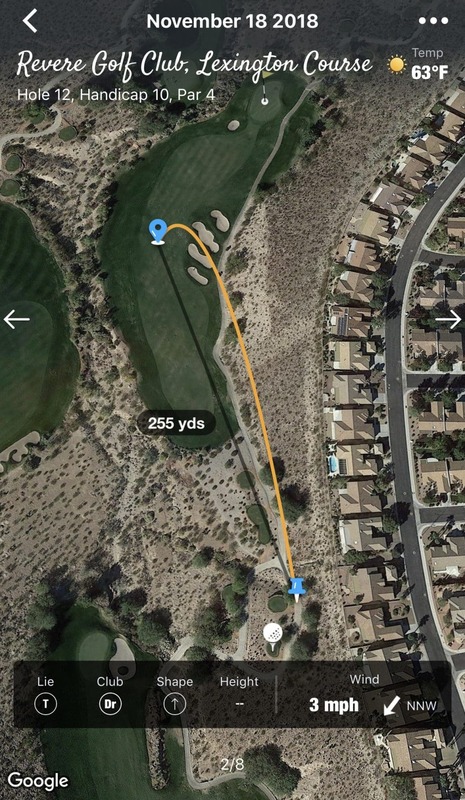 18 Birdies Features that will make you want to use the app. You can tell from what I’ve posted already the app is rich with features. But there was one addition earlier this year to the app that changed the way I used it and will use it forever. That was when they added the ability to use your Apple Watch to check yardages and input your score. Everything you need is right there. Distance to the back, center, and front. Hole number, score to par, handicap. It’s brought an entirely new user engagement to the game, and I love it. Plus, once you finish the hole a simple swipe and you can input your stats from the hole just played and never pick up your phone. I’ve been using the 18 Birdies app for a while now. Call me a total fanboy for sure. This addition though took them over the top in my opinion. It added a feature that even though not everyone will use, it’s still there to be taken advantage of, and it’s the reason I went and got an Apple watch. 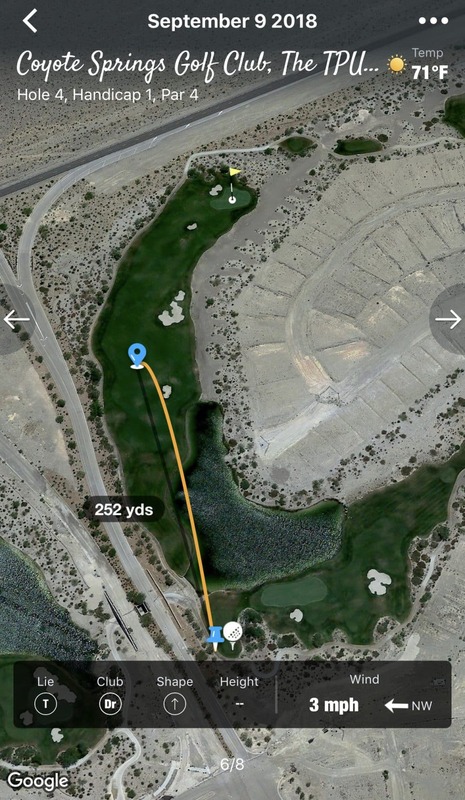 Shot tracking could easily be the best feature of 18 Birdies. 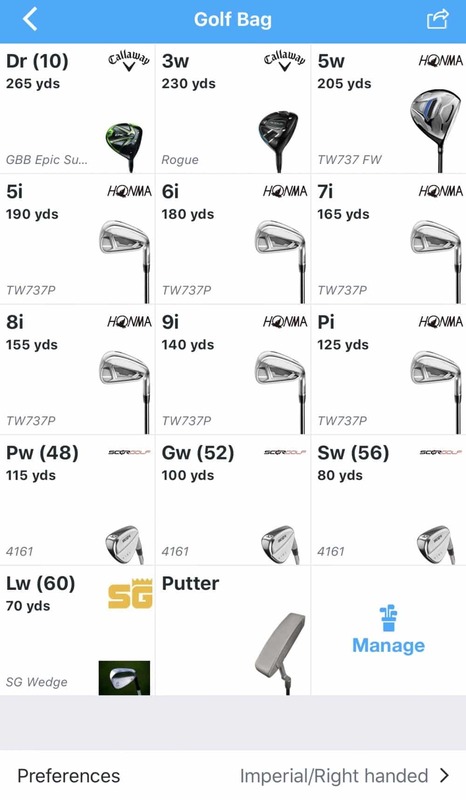 From your main “ME” page you can input into the app the clubs in your bag. Then, while playing, you can track your shots using the GPS and get very accurate distances. Shot tracking alone is pretty damn cool, but where 18 Birdies amplifies the process is the “caddy” feature. 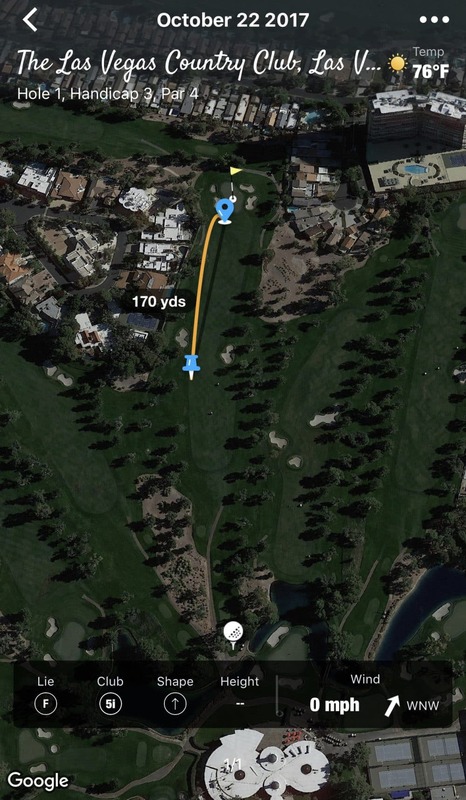 The more you track your shots, the more, the app will assist you in choosing the club for the shot you want to hit. I’ve just started using this part of the app on a more consistent basis. As much as I love screwing around with my phone, I’ve been trying to focus more on what’s happening on the course vs. my phone. But, for those players who are trying to get an understanding of their club distances, this is an excellent way to go about getting those numbers. Every time you input a score, share a round, make friends, etc. 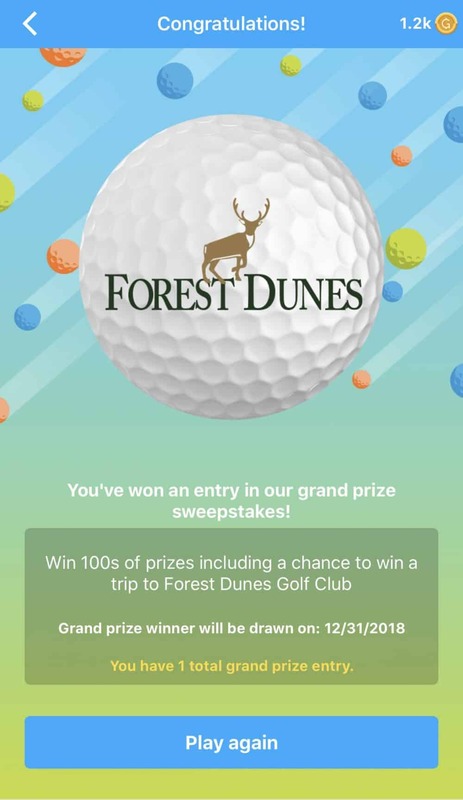 you earn “golf bucks.” The golf bucks can then be used to purchase scratch cards that will 99/100 gain you an entry into their monthly giveaway. Which I can tell you is usually a sweet grand prize. But, occasionally you’ll scratch a winning card and win a prize. I recently won the SuperSpeed, swing trainer. Now that’s a heck of a prize in my opinion. 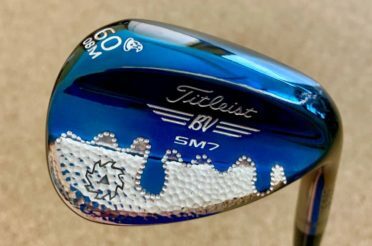 I’m looking forward to its arrival, so I can get working on speeding up my swing. Just another way 18 Birdies is helping me improve at golf! 18 Birdies can’t do all of this for free! 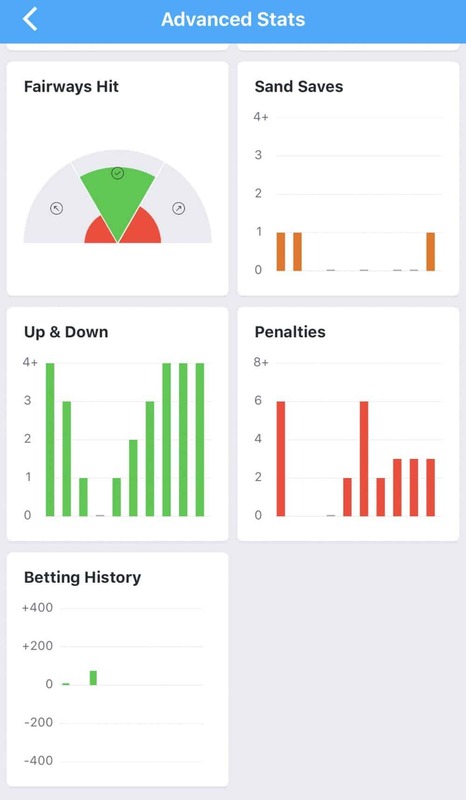 Like most apps, I’m sure they’re taking advantage of the advertising possibilities but to truly have some amazing features, as they do, they needed to have an option to offer the best stats and features and be able to charge for users to get access. 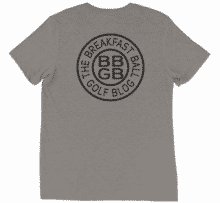 The premium membership has its advantages, especially for golf geeks like myself. ADVANCED GPS: Make the most accurate club selection for any shot with added GPS data points such as elevation, temperature, humidity, and wind. CADDY+ CLUB RECOMMENDATIONS: Take the guesswork out of your game. 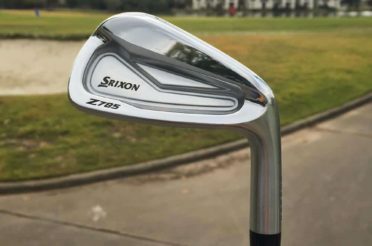 With club recommendations, we’ll tell you what club to hit for each shot based on your own playing style. It’s like having a virtual caddy in your pocket! STROKES GAINED SCORING: Want pro-level stats? With strokes gained scoring, you can find out where you are losing or gaining strokes against the field. 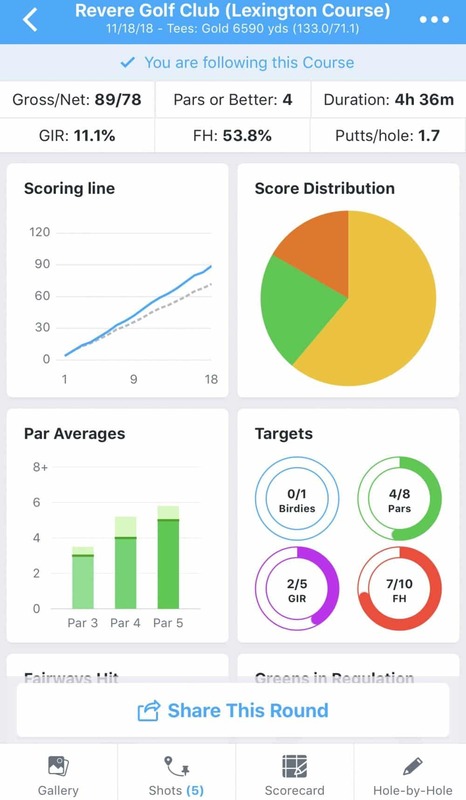 Track each shot you take on the course to get detailed performance statistics compared to different sets of golfers (of various skill levels). See where you stand on a shot by shot basis, or by category (Off The Tee, Approaching The Green, Around the Green, and Putting). ADVANCED GOLF STATS: Get more insight into your game by analyzing your stats with new charts and custom filters. 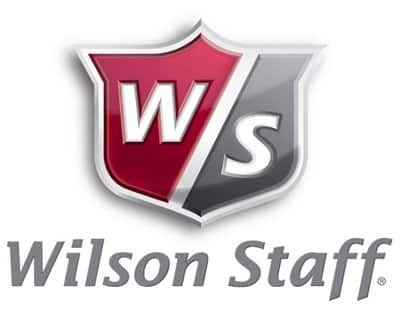 PREMIUM LESSON PLANS: Access our full catalog of Premium video lessons, taught by top-tier golf instructors. 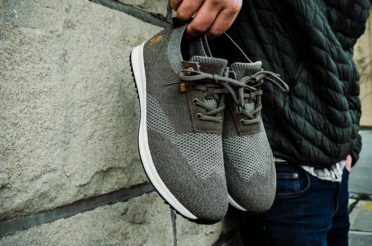 PARTNER BENEFITS & DISCOUNTS: Gain instant access to our growing list of partner discounts from Golf Digest, GOLFTEC, Swiftwick, REDVANLY and more. SIDE GAMES: Raise the stakes! Add a friendly (or not so friendly!) level of competition to your round with complete access to our full games library featuring Skins, Vegas, Nassau, Wolf and much more. GROUP OUTINGS: Host a single or multi-round tournament for a large group of your friends! Play together on the same course or compete “virtually” on any course in the 18Birdies database. I’ve paid for a ton of golf apps, and by far 18 Birdies has the best features for the money. 18 Birdies are continually updating the app and making the features better. 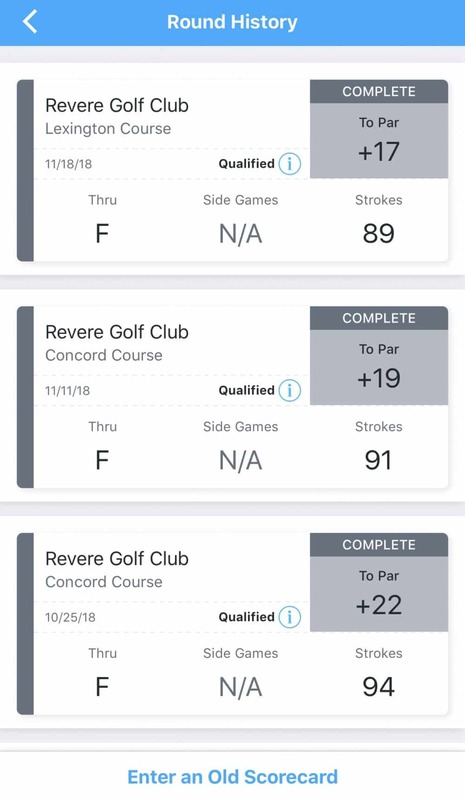 Earlier this year they added a Strokes Gained feature that confused the hell out of me and I’m sure a lot of other players as well. 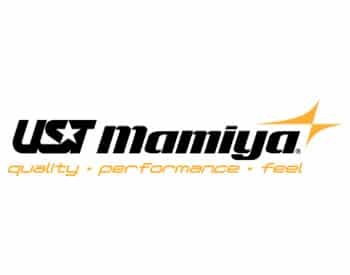 The idea was great and I was eager to give it a try but without testing it out first, I gave it a go on the course for the first time and failed miserably. I wasn’t alone. Just a short time later 18 Birdies came out with an update that fixed all the issues and brought back the ease of use that has captivated most of the players who use the app. That says a lot to me about who 18 Birdies are as a company. They listen, take the feedback from their users and do so to make the app better. A few times I’ve had to reach out to 18 Birdies and to my surprise they get back to you pretty quick. 18 Birdies, the best golf app for your phone period. 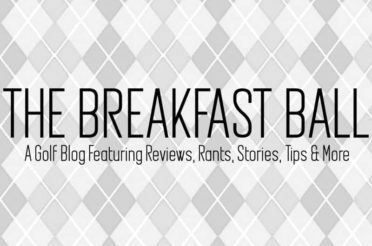 We review a lot of products here on the Breakfast Ball, some we get for free and other we find on our own and want to share with all of you. Now and then we come across a product that we believe in so much it would be a disservice to not share on the site. 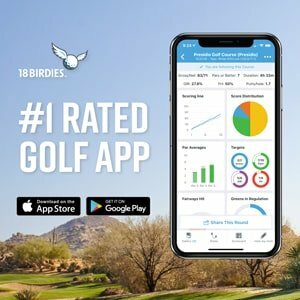 The 18 Birdies app is one of those products. I convinced JT to check it out and some of my other friends as well. 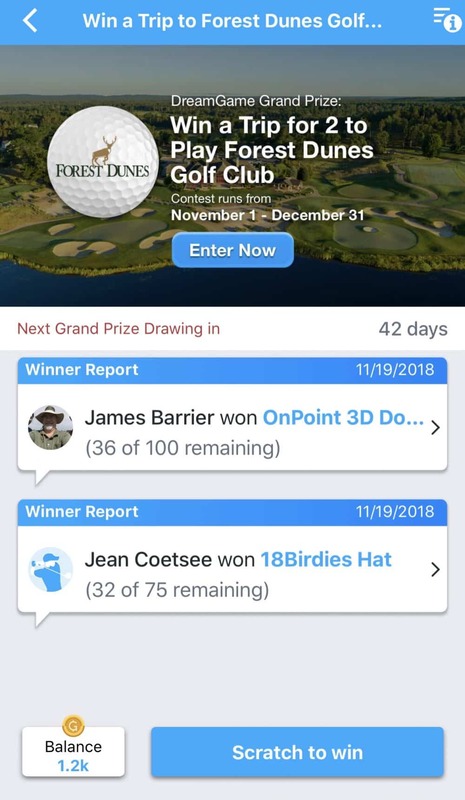 When my hometown friends and I get together and have our “Boyz” tournament once a year, the 18 Birdies app is one of the most talked about things of the weekend. Because of how much entertainment it brings to the matches we all look forward to seeing who comes out on top in all the side games. Hands down I don’t think there is a better golf app you can download. The free features alone are worth the data you’ll use. And now that they have added the ability to book a tee time within the app it shows the evolution of the 18 Birdies app is still happening. Whether you chose to go with the Premium Membership or the free version, we believe you can’t go wrong with adding the 18 Birdies app to your phone. Be sure to check out the 18 Birdies app and their social accounts. Great article! I love the app also. 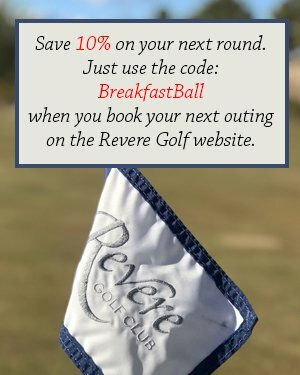 Has really helped me work on improving my game and I have even won a couple of prizes!